Nigeria began counting votes in yesterday's closely fought presidential election although the electoral commission extended voting hours in some places where polling stations opened late or ballot machines malfunctioned. President Muhammadu Buhari and his main challenger, businessman Atiku Abubakar, both said they were confident of victory when casting their ballots in an election which has already been delayed by a week. Analysts say the vote in Africa's biggest economic power is too close to call, with the outcome set to hinge on which man voters trust the most to revamp an economy still struggling to recover from a 2016 recession. Buhari, a former military ruler who was later elected president, is seeking a second term in charge of Africa's most populous nation and top crude producer. Atiku, a former vice president, has pledged to expand the role of the private sector. The two men lead a field of more than 70 candidates in an election which the commission postponed last Saturday just hours before voting was due to begin, citing logistical issues. The country has 72.8 million eligible voters. Voting had been completed in some areas across Nigeria and counting of ballots was taking place. Senior Independent National Electoral Commission (INEC) official Festus Okoye said the commission had extended hours in polling stations that had experienced delays. He also said problems encountered during the voting, including security issues, were being addressed. These included malfunctioning of voter card machines which would be replaced. Gunfire and explosions were recorded during the day - however police in Maiduguri, the capital of Borno state, said that they had triggered the explosions, shortly before polls opened to deter Islamic extremists. Contradicting this, security sources said a rocket hit a displaced persons' camp, while a blast at an army garrison killed one solider and injured four others. Gunfire also was heard in Port Harcourt, where the military presence was heavier than in past elections. One convoy in Delta state contained more than 25 vehicles with battle-ready soldiers. Turnout appeared to be light as authorities tried to calm panicked, sceptical residents. Atiku later cast his ballot in the eastern Adamawa state. "I am impressed by the turnout of the people," he told reporters shortly after voting. "I look forward to a successful transition," he said. 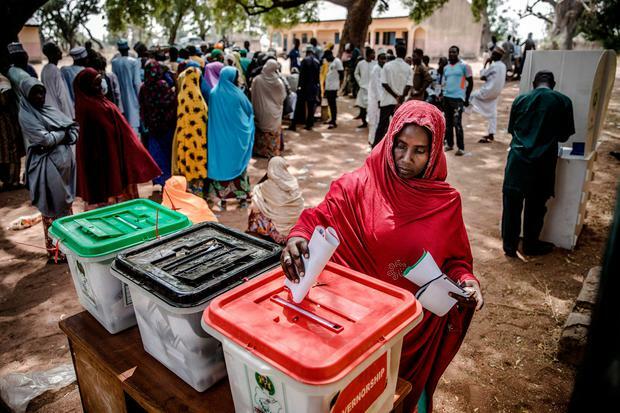 After voting in the northern Kano state, Hadisa Hayatu, a 38-year old housewife, said: "I voted for Buhari because he has assured us that he is going to build on what he has done on security and other issues."